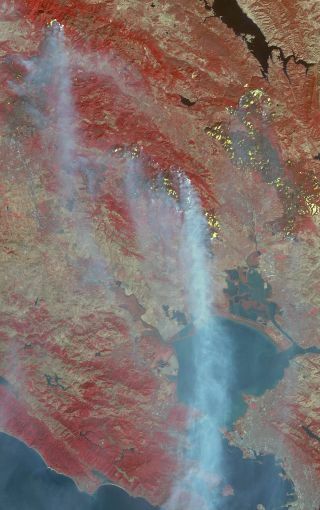 NASA's Terra satellite acquired this image of the major fires burning in Northern California's wine country the morning of Oct. 12, 2017. NASA is well known for observating space, but the agency also has a strong hand in monitoring Earth. NASA's Earth Observing System (EOS) is a collection of satellites designed to monitor and understand key components of the climate system and their interactions over an extended period. "NASA and other space agencies had launched satellites to study [Earth] before," the agency said in a press release after EOS had operated for a decade and a half. "But the past 15 years have produced a more comprehensive look at Earth from space than any other period in history. At a time when our planet is undergoing critically important changes, this global view offers not only stunning imagery but also vitally important information about how Earth is changing." From its birth, NASA has focused not only on getting into space but on the Earth we launch from. In 1960, the agency launched its first weather satellite, TIROS 1. Although it operated for only 78 days, it demonstrated the feasibility of monitoring Earth's weather and clouds from space. Several subsequent satellites continued to study Earth over the years, probing different aspects of the planets. Planning for the EOS mission began in the early 1980s, according to NASA's Earth Observing System (EOS) Reference Handbook. EOS was recognized as part of the Presidential Initiative Mission to Planet Earth in 1990, receiving its new start (and funding) from Congress. The program's initial guidelines stressed the need to ensure continuity of observations for at least 15 years, though some instruments may fly only once. In June 1992, the National Space Policy Council issued National Space Policy Directive 7. The document directed NASA to implement the restructured EOS program as part of an overall space-based global change observation system. "Scientific research shows that the Earth has changed over time, and continues to change," says the EOS Handbook, which was published in 1993. "Human activity has altered the condition of the Earth by reconfiguring the landscape, by changing the composition of the global atmosphere, and by stressing the biosphere in countless ways. There are strong indications that natural change is being accelerated by human intervention." EOS is made up of 26 satellites that have orbited or continue to orbit the planet since the program began. The first of these satellites was launched on Dec. 18, 1999. Terra (originally known as EOS-1) was designed for a five-year mission life, but continues to orbit today. In 2017, dwindling fuel supplies led scientists to begin discussing whether to use the last of the resources to maintain Terra's current equator-crossing time, which will lead to an additional three years of continuous climate quality data, or to use some of the fuel to lower the orbit, sending Terra plunging into the atmosphere sooner. "A major impact of lowering Terra's orbit is a change in its crossing time," NASA's Terra website says. According to the website, a body of scientists acquainted with Terra's instruments concluded that a "change in the crossing-time would mark the end of Terra's 'climate quality' data record for trend analysis." A satellite called Aqua launched on May 4, 2002. Named for the large amount of information it collects about water in Earth's system, Aqua gathers information from a stream of about 89 gigabytes of data each day. These variables include almost all elements of the water cycle and involve water in its liquid, solid and vapor forms. Although it was only designed to last for six years, Aqua is still in space today. Aura launched on July 15, 2004. The satellite's four instruments study the atmosphere's chemistry and dynamics. Its measurements help investigate questions about ozone trends, air-quality changes, and their linkage to climate change. Designed with a six-year life, Aura also continues to operate today. Together, Terra, Aqua and Aura are often called the three flagship satellites of EOS. Today, EOS is made up of 18 Earth-observing satellites that have revolutionized our ability to observe our planet from space. The satellites not only monitor climate changes on Earth but also things like wildfires in California and tropical storms. In 2016, NASA announced its plan to launch a suite of small satellites into Earth's orbit to study weather patterns and climate change. "Small satellites have several advantages," said Ellen Stofan, then-chief scientist at NASA Headquarters during a teleconference. "They reduce the risk and cost of demonstrating precursor technologies and infusing them into larger flight projects. They're used for flight testing and demonstrating new proof-of-concept components. And they enable affordable distributive science observation systems using constellations or swarms of small satellites to achieve broad coverage."